LET’S MIX IT UP THIS EASTER AND CREATE A CHOCOLATE GRAZING TABLE THAT WILL BLOW EVERYONE'S LITTLE FLUFFY COTTON BUNNY TAILS OFF! You’d be hard-pressed to find anybody who doesn’t celebrate Easter with a chocolate egg. But you don’t have to stick to the traditional eggs anymore, the assortment that is available is mind-blowing and getting yummier by the year. But before I keep a selection aside for gifts, I have picked out some favourites to make a grazing table for all my guest's dessert come Easter Sunday. So if the weather allows, create a little outdoor grazing table. And if it doesn’t, a sideboard can be easily styled like this - it’s a nice change from a predictable sit-down dessert. So make a few cups of tea, sit back and snack away. 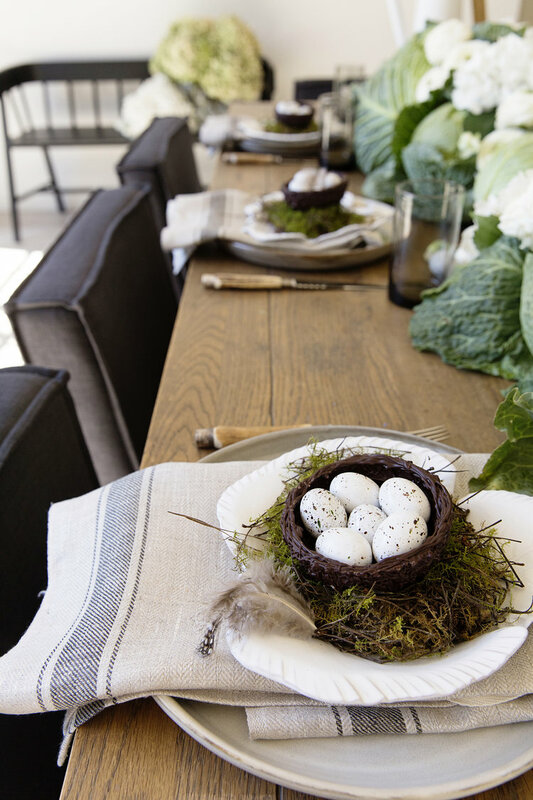 WHY NOT TAKE EASTER LUNCH OUTDOORS AND CREATE AN INTIMATE SETTING? First, I covered the table with moss. I love using this as a base for an outdoor table as it wows your guests. I get mine from Flowers Vasette and it comes in a bag-full, almost like sheets, so it is very easy to use and move around. To get the full effect you don't have to cover the entire table as i have, even using moss as a centrepiece is a dramatic statement. I then surrounded the moss with little feathers, eggs and nests made from dodo vine. This creates a gorgeous little scene and without being traditional, is still a nod to he history of Easter itself, which amongst other things, symbolises new life and rebirth. Instead of using cut flowers, I went to the local nursery and bought small punnets of pansies to fill the space. These went straight on to the table but you could also leave them in their pots surrounding them with moss. I love the thought of planting the pansies up in tall glasses or small vases down the centre of the table; there are so many ways you could style it. The great thing about punnets of flowers is that they can be planted in your garden afterwards. No wastage here! NOW CAN I JUST TALK ABOUT THIS FLORAL CENTREPIECE? HOW GORGEOUS DOES IT LOOK! 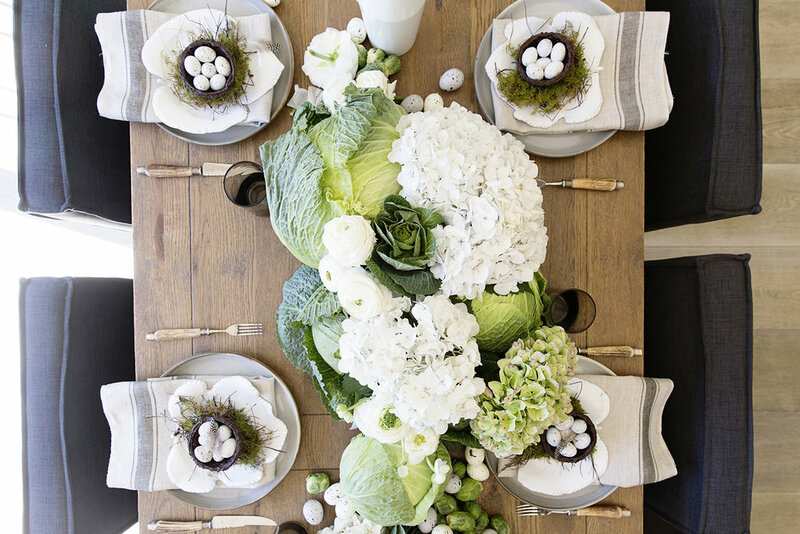 Using a simple combination of cabbages, brussels sprouts, white hydrangeas, ranunculus and a scattering of flecked eggs I have continued the ‘Easter in the farmyard’ feel. A set up like this is simple but needs a lot of playing about. For this table setting I have cut the stems off the flowers, meaning that they are only a temporary display for lunch. This may seem wasteful but remember you can always pop them in smaller specimen jars and float them in bowls once lunch is over. While the cabbages and sprouts can be reused and frozen or composted, or eaten throughout the week. 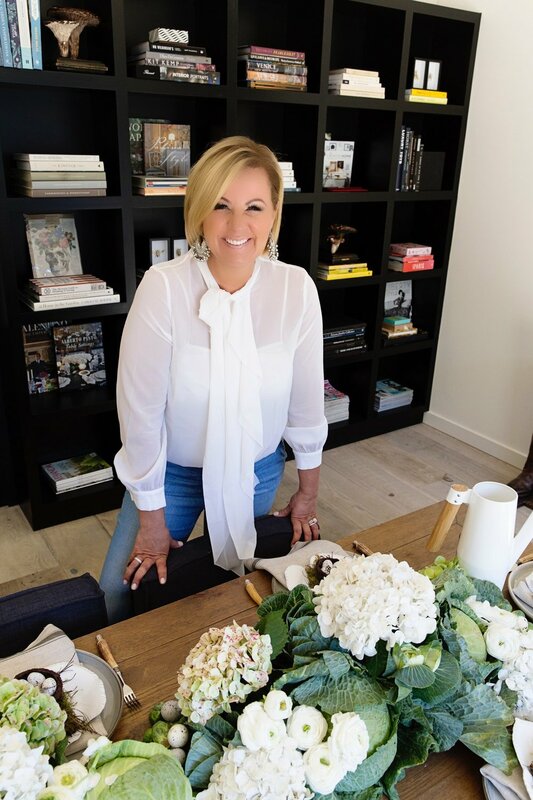 Keeping the palette simple with a mixture of whites, creams, and fresh garden greens, is such a nice way to bring the garden inside, almost like the bunnies can come in and join us! When styling this Easter setting, I took my inspiration from farmhouse style, so the base plates were purposefully kept neutral because I wanted my white leaf plates sitting atop to be the focal point. These particular plates were hand made for me in the south of France (you know all about my plate obsession, right?!) Sitting the white on the neutral really shows off the leaf shape beautifully. HOW HAS EASTER COME AROUND SO FAST! WAS IT NOT JUST CHRISTMAS…? Easter Lunch is the perfect time to show off this beautiful Canvas and Sasson block printed tablecloth, I based my easter look on this colour palette, keeping it light and fresh. The white and blue, although not entirely matching throughout the table, can be seen in the plates, the glasses, the mismatched napkins and my collection bunnies holding the divine bouquets of hydrangeas, making this table soft and pretty. An Australian easter is in Autumn, so the weather is cooling down but with a few gorgeous warm days here and there, so a fresh light table suits the temperature as well as we get the most out of what is left of the sun. As a final touch, you have to have a little gift for every guest - it's the rules. A simple ribbon wrapped pile of gingerbread that matches my decor is the perfect solution for an Easter treat. Just don’t eat them before lunch! BUT BEFORE ALL THAT STARTS - WHAT ABOUT BREAKFAST? On Easter morning I absolutely treat myself to hot cross buns from Phillipas as they are my favourite. With lashings of delicious French butter and a big bowl of berries and muesli, what a perfect start to the day! Top that breakfast off with fresh orange juice, a pot of lady grey tea and I'm happy. I am also quite tragic as I have Easter bunny ears for us all to wear and let me tell you - if you are home for easter it doesn't matter if you are a kid or a grown up you are wearing the bunny ears - we all wear them - like it or not.